At a glance, this is something that many will say is simple. Dofollow links are good, nofollow links are bad, right? If you’re only concerned about direct and immediate link equity – the factors that Google takes into consideration when generating its organic search results – then this may be true. Yet, in the long run, this approach means that you’re ignoring a vast wealth of potential. It has never been explicitly stated that each and every nofollow link is ignored by Google. According to the company itself - “In general, we don't follow them”. This implies there could be rare exceptions. Google also mentions that nofollow links can be indexed, which is something we’ll get to shortly. However, it’s been heavily suggested that Google still considers nofollow links as part of a healthy backlink profile. A profile that has 100% dofollow links can suggest numerous things, such as promotional content and paid links. Search engines have been getting smarter and smarter on penalising (or simply not favouring) such ‘unnatural’ profiles, whether its nothing but dofollow links or links that specifically over-prioritise exact keyword anchor text. So, having nofollow links is a worthwhile safety net to have. If a nofollow link appears online, sending traffic to one of your pages that previously hasn’t been linked to, this can still be beneficial. After all, this link can prompt Google to index the page. This best example of this comes from Eli Schwartz over at SurveyMonkey. Using an old 404 page on, Eli created a link with atypical anchor text. When Google crawled the 404, it also went through the link and indexed what it found. This test was done with both a dofollow and nofollow link, with both being indexed in less than 2 days. The only difference is that Google didn’t much care for the nofollow link’s anchor text. Yet, that’s to be expect. What’s important here is that nofollow links still ensure search engines can find, crawl and index your website, even if it’s not passing equity or making a note of anchor text keywords. 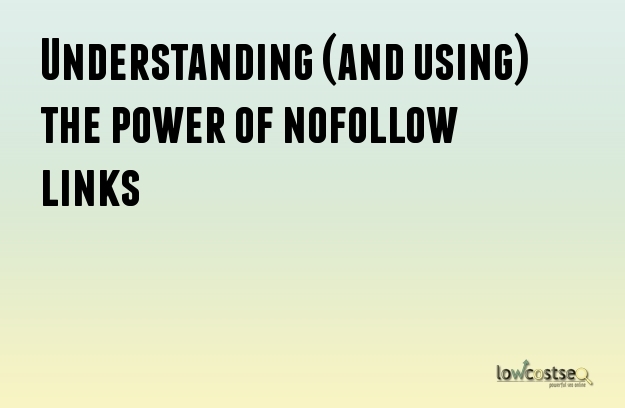 When talking about nofollow links – and links in general – it’s very easy for SEOs to focus on the potential of that link alone. This is why many simply don’t work with platforms that are known for nofollow links. They fail to see the value beyond the initial link, and that’s a mistake. Thinking like a marketing specialist, however, and links are a little different. Getting your link on a strong platform is exposure. Make a big enough splash and the ripples will help spread your content. If people like what they see, they will share it on their smaller platforms – and many of these links will be dofollow – generating extra links, visibility and traffic. This strategy has been successfully implemented numerous times. In one such case study, Paul Marino at Teknicks increased organic traffic by 288% over 18 months. He did this with 99 new links – but only 11 of which where dofollow. So, a nofollow link might not pass link equity in the way many SEOs understand, but it is still exposure. And exposure, on it’s own, can lead to more links. After all, the above examples both resulted in increases of organic traffic – people driven through due to increased visibility on search engines. This doesn’t even include direct traffic from those links. If you’re targeting the right platforms with the right people, that’s an added bonus, regardless of whether its a dofollow or nofollow link. Of course, dofollow links are great, but don’t turn down opportunities for nofollow links. As we’ve explored, they have the potential to help with indexing, they help keep Google happy and they can even, in time, generate further links. Ultimately, however, a link helps drive traffic. The goal of SEO isn’t always about organic visibility. Sometimes driving traffic – even if its not directly from Google – is just as important. If you include nofollow links in your campaigns, this will be a side benefit in addition to moving up the SERPs.